Still thinking if it’s worth while converting your app to UWP? Think again or you might lose a big part of your clients. In the latest Windows Insiders update there is a new feature that allows the OS to block installation of Win32 apps outside of the store. This means your MSI/EXE will no longer work for the users that have this option enabled. Who Will Block Win32 Apps? Obviously, consumers will not want to enable this option, but many of them don’t have the tech skills to investigate and modify it, if let’s say Microsoft decides to push an update which enables the option. However, the more plausible scenario is for users in controlled environments, for example: schools, hospitals, and of course the big companies. All these use management tools to administer the client PCs for the employees/students. In such cases, multiple reasons, like security, ease of management, saving costs on application (re)packaging and testing and many more can lead to the IT team deciding to block non-Windows Store Win32 applications. Worry not. 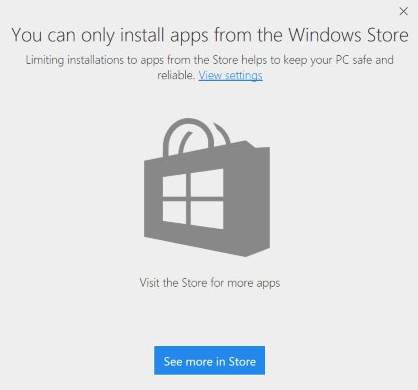 Microsoft already knows that nobody will rewrite their application just to get in the store. You can also publish a Win32 application in the Windows Store, through the Desktop Bridge program, with the help of Advanced Installer or the Desktop App Converter tool from Microsoft. The technology behind the Desktop Bridge developed by Microsoft, also leveraged by Advanced Installer, allows you to package your Win32 application as an AppX without changing almost nothing in your code. You can continue building an MSI/EXE installer for the rest of your clients and deliver the AppX from the Store or directly to new customers that require it. Once you have an AppX package for your Win32 application you can also start using UWP APIs, for example updating a live tile, and continue with planning a long term migration towards a complete UWP application, step by step. If you liked this article check out our blog, you can read more and subscribe. Latest releases, promotions and events. © 2002 - 2017 Caphyon Ltd. Trademarks belong to their respective owners. All rights reserved.